City Opportunities, a scheme which hopes to transform the futures of young London-based adults who have spent their childhood in care, recently entered its fourth year with a week-long programme of events. The five-day City Opportunities programme introduces care-leavers between the ages of 16 and 24 to higher education choices and subsequent career opportunities in business and finance. The participants work with London South Bank University (LSBU) student ambassadors, many of whom are care-leavers themselves, to build confidence and aspirations. 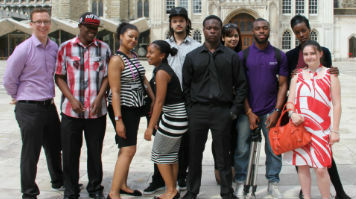 The programme, which was piloted in 2010 and has since won a London Education Partnership Award in 2011 and Times Higher Education Award for best Widening Participation Initiative in 2012, is run by LSBU in collaboration with City HR association, and is funded by the City of London Corporation as part of its commitment to bridging the gap between the City and its neighbours. Sampling university life first-hand, participants attend taster lectures and seminars at LSBU. Guidance on financial support, workshops on career routes and requirements, and a behind-the-scenes tour of a City powerhouse help the participants realise that higher education and professional careers are within reach. Vanessa Brooks, City Opportunities Project Officer at LSBU, says of the project "As young people progress over the course of the intensive programme, the change in their attitudes, aspirations confidence and self-awareness is really noticeable. They begin to develop their team-working skills with their peers as well, and have the chance to see that higher education and a professional career is an attainable dream for them." Mark Ellis, Schools and Colleges Outreach Manager, said: "The uniqueness of this project is that it introduces people from one of the most marginalised groups in our society into the corridors of power and privilege. The staff from these organisations challenge the participants to believe that they can aspire to work in a City firm, and the staff in turn are challenged by the abilities and extraordinary personalities of the young people, which belie the stereotype of those who have been in care." The scheme will run three times in 2013, with the next week of events set to take place from 5-9 August.